Winter can really take a toll on your skin. The lack of sunlight and harsh, bitter temperatures can leave it flaky, dull, and dry. Thankfully, spring has arrived and it’s time for your skin to get its sunkissed glow back. But, did you know that spending time in the sun isn’t the only way to bring your skin back to life? There are plenty of delicious spring veggies that can improve the texture, tone, and moisture level of your skin. These veggies can also protect your skin from the sun damage that can occur as a result of spending more time outside. Keep reading to find out which vegetables you should add to your diet for glowing skin this spring. Need recipe ideas? 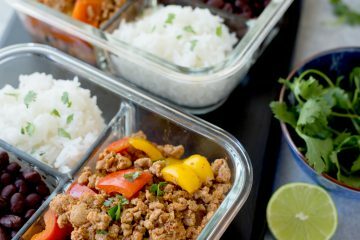 Get hundreds of healthy dishes and meal prep tips on Mealplan. 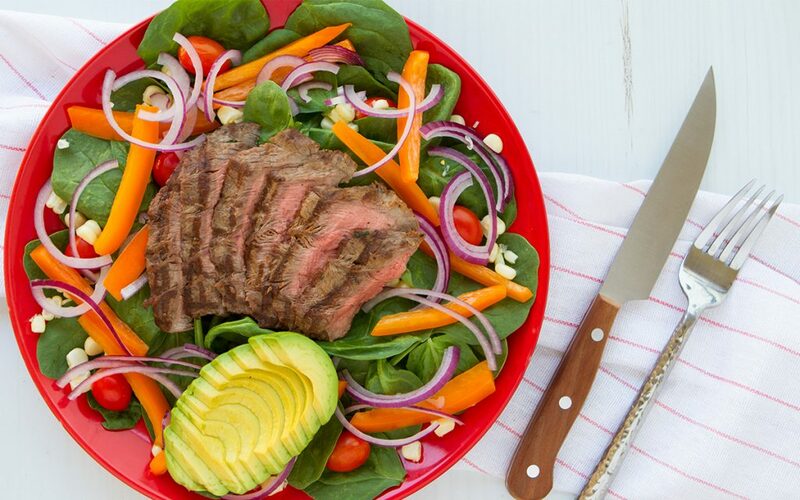 Mike O’Hearn’s Epic Steak Salad. Get the recipe on Mealplan. What makes this spring veggie so great for glowing skin is its high level of vitamin C. Most people think of oranges and other citrus fruits as the go-to vitamin C sources, but just one cup of chopped bell peppers can supply you with 317% of the recommended daily intake. This vital nutrient is necessary for the production of collagen, which improves the strength and texture of your skin. Vitamin C is also an antioxidant that protects your skin from sun damage and harmful free radicals. Getting an adequate amount of vitamin C in your diet reduces signs of aging including wrinkles, dryness, and roughness. Red, yellow, and green bell peppers are also a great source of vitamin A. This vitamin has been shown to help repair the skin and reduce flakiness. 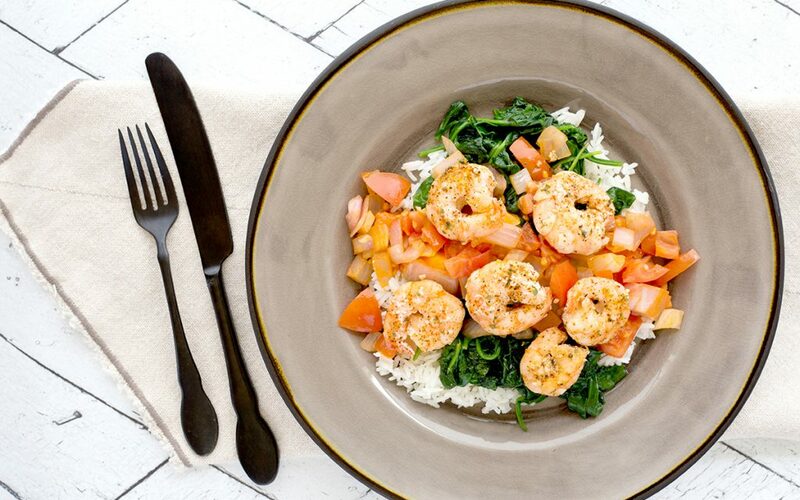 A single cup of chopped bell peppers contains 92% of the recommended daily intake of vitamin A.
Cajun Shrimp with Spinach. Get the recipe on Mealplan. Because of its year-round availability, most of us don’t think of spinach as a spring vegetable. However, this antioxidant-rich veggie is at its greenest during spring. Cooked spinach is packed with vitamin E, which has been shown to slow down the skin’s aging process and protect it from free radicals and UV damage. Spinach is also a great source of beta-carotene. This antioxidant acts as a natural sunscreen, and it’s also believed to warm up your skin tone and leave you with an orange hue. Beta-carotene keeps the skin supple and moist which contributes to a more youthful and vibrant appearance. Another interesting fact about beta-carotene is that the body converts it to vitamin A, so eating plenty of spinach will give you the skin restoration benefits that this vitamin provides as well. 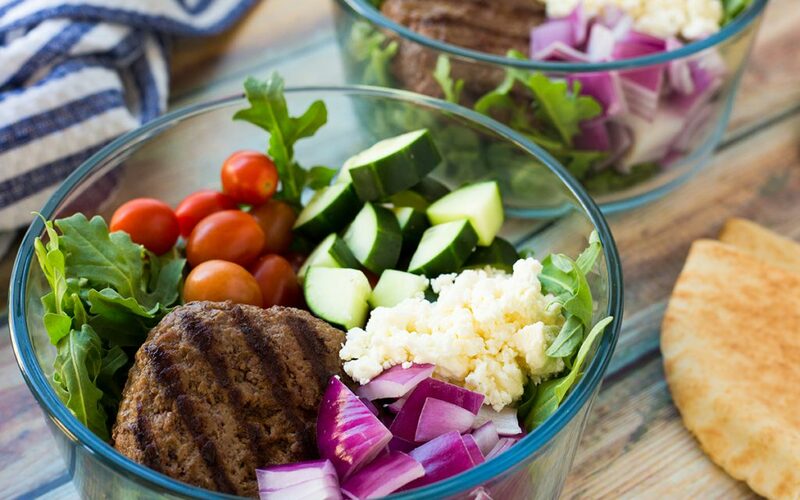 Greek Bowl with Arugula. Get the recipe on Mealplan. This cancer-fighting superfood is a tasty alternative to iceberg lettuce for your spring salads. Salad lovers appreciate the peppery taste of this leafy green, and it’s also packed with plenty of nutrients to revitalize your skin! Arugula contains high amounts of anti-aging and protective agents like vitamins A, C, and K.
Arugula is also rich in folate, which is alternatively known as vitamin B9. This detoxifying nutrient aids in tissue growth and the production of new skin cells. Folate can decrease acne and give your skin a radiant glow. Sulfur is another rejuvenating nutrient that you can get from eating arugula. Like folate, sulfur helps with tissue repair and cell regeneration. You may notice that quite a few skin care products contain sulfur. This is because this mineral has been linked to slowed aging and wrinkle prevention. 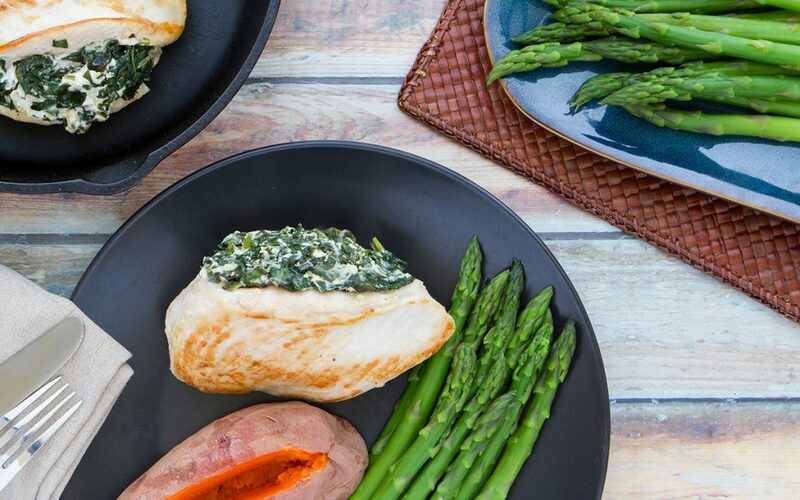 Spinach and Goat Cheese-Stuffed Chicken with Asparagus. 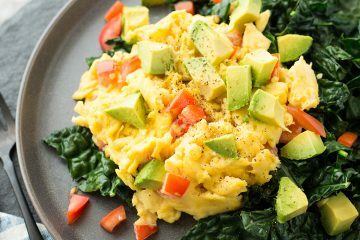 Get the recipe on Mealplan. This spring veggie is only in season for a short time (late March-early May), so you’ll definitely want to take advantage of its benefits this spring. It’s packed with nutrients like vitamin K, vitamin E, and folate. It’s also another great source of vitamin A. Each of these nutrients contributes to glowing, healthy skin. Vitamin K is key for healthy skin and nails, and you can get 101% of the daily recommended amount from a cup of cooked asparagus. Vitamin K’s skincare benefits include reducing the appearance of dark circles under the eyes, soothing inflammation, and improving the elasticity of the skin. It also aids in protecting the collagen that vitamin C helps to produce in the body. Asparagus also contains high amounts of potassium. It’s important to consume enough of this mineral if the winter weather has left your skin looking cracked or dull. Potassium promotes new skin cell growth which will help clear away acne scars and blemishes. Shrimp and Veggie Stir Fry with Green Peas. Get the recipe on Mealplan. If you want clearer skin this spring, then fill up on green peas. They’re a great source of restorative nutrients like vitamin K and niacin. Although green peas are technically legumes, they’re often grouped with starchy vegetables due to their high percentage of complex carbs. Nonetheless, green peas are one of the few plant-based sources of absorbable niacin, which is also known as vitamin B3. Eating just one cup of green peas will supply you with up to 20% of the daily recommended amount of niacin. Aside from warding off acne, niacin may also relieve symptoms of rosacea and decrease skin redness. Consuming high amounts of this anti-aging vitamin will leave your skin feeling nice and moisturized. Some studies claim that niacin is also effective in preventing skin cancer. As you can see, spring veggies contain a variety of vital nutrients that will give your skin a healthy glow. 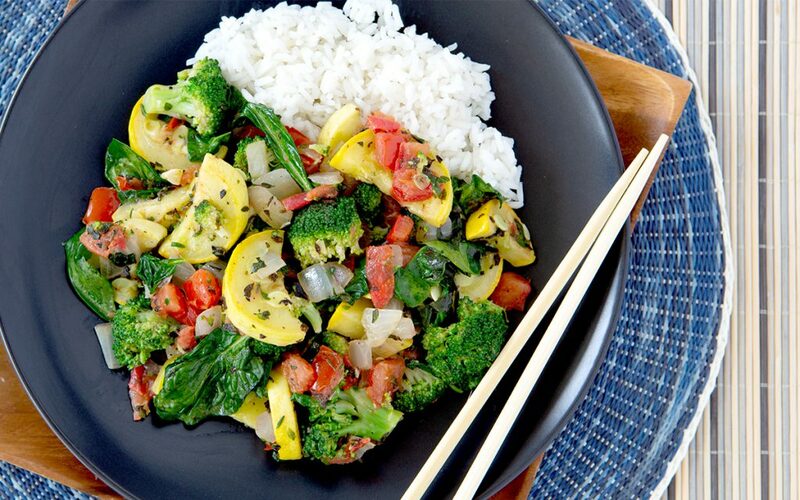 So, if you want to rejuvenate your skin this spring, grab hundreds of veggie-packed recipes on Mealplan.